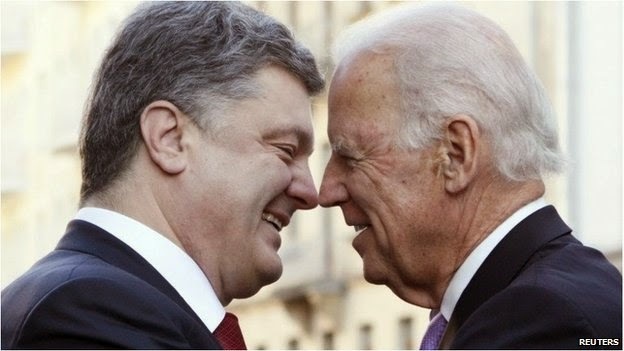 US vice-president Joe Biden (right) sees eye to eye with Ukraine's President Petro Poroshenko during his visit to Kyiv on the Maidan anniversary, November 21, 2014. Links International Journal of Socialist Renewal has published various left viewpoints from the region on the political situation in Ukraine. December 5, 2014 -- Links International Journal of Socialist Renewal -- On November 21, 2014, Ukraine triumphantly celebrated the first anniversary of the “Euromaidan”, which not only changed the situation in our country fundamentally, but also substantially altered the agenda of world politics. In November 2013, when the protests in Kiev had barely begun, few would have expected their consequences to become so massive. After the country’s then president Viktor Yanukovich had decided to postpone indefinitely the signing of the agreement on association with the European Union – since, in his view, it could damage the national economy – activists of right-wing and liberal parties flocked to Kiev’s central square, mobilised by appeals from the main organs of the mass media . The activists succeeded in drawing large numbers of apolitical Ukrainians over to their side, and ultimately, after bloody clashes in the centre of the Ukrainian capital, forced the president from office. What has happened in Ukraine in the year since then? In essence, Ukraine is now a completely different country – without Crimea, without the large industrial cities of Donetsk and Lugansk, and without the coal reserves of the south-east that are essential if heating is to be guaranteed in Kiev during the winter. Obviously, all these changes were conditioned by the process that began on Ukraine’s main square. Only a few people at that stage sensed the danger and warned of it. But within a few months a civil war had become a tragic reality, with massive casualties among the peaceful population. Modern techniques for killing humans were being used in a way that had seemed unimaginable in November 2013. Why have we paid this price? Have the promises used by the opposition to mobilise the participants in the Maidan protests been realised? If we analyse the underlying factors of Ukraine’s economy and politics, what have the people who came out a year ago to demand improvements in their lives actually received? Ukraine in the lead-up to the “Euromaidan” was in a state of chronic crisis, which graphically demonstrated the poor viability of its social and economic system. During the presidency of Viktor Yanukovich the living standards of Ukrainian citizens had fallen year on year. This decline, however, had proceeded in more or less linear fashion, without catastrophic collapses. Yanukovich, of course, would have been delighted to force neoliberal reforms on the country, economising on the social spending that was so burdensome for the budget. But he understood that this would deal a serious blow to his electoral base; it would be ruinous for the state employees and pensioners who pinned their hopes on “stability”, and most importantly, would spur large street protests headed by the opposition, with full-scale support from its foreign suzerains. For this reason the Party of Regions government that held office in Ukraine until the fall of Yanukovich showed restraint. The caution ended once a new coalition, enjoying the full approval of the West, had come to power. These people took control of the country under the banner of political nationalism and liberal reforms, and the considerations that had restrained Yanukovich no longer held them back. From the beginning it was understood that having taken power, they would continue the policies of the previous government – but now, with no regard for the views of the citizens whom these “reforms” would destroy in the literal sense. Predictably, blame for the results of these policies would be laid on “enemies of the nation”. And so it happened. The new Ukrainian authorities automatically ascribed responsibility for the catastrophic social and economic consequences of the Euromaidan to the costs of the “anti-terrorist operation”. Meanwhile, according to official data released just before the elections, the real wages of Ukrainians had fallen by 11.4 per cent compared with their level in September 2013. The total of unpaid wages in Ukraine in September 2014 had risen since the beginning of the year by a catastrophic 156 per cent. At the same time, a total of 1.4 billion hryvny had been extracted from Ukrainians through the tax introduced by the Supreme Rada [parliament] in order to finance the war. Ukrainian sociologists of course understand that these are “forgiving” data, and that the real wage debt owed to residents of the country is even greater. But in any case, the figures provide an outline of the situation prior to the collapse of the hryvnia in November. Since the time of Yanukovich, the Ukrainian currency has now declined in value against the dollar by more than half. Neither employers nor the government are ready to provide compensation for the effects of inflation on welfare payments and wages, which have fallen catastrophically behind the rise in prices for essential goods. When these processes are taken into account, the cost to Kyiv residents of a loaf of bread in the autumn of 2014 was three times its level the previous year, while utility charges were almost double. This was at the same time as the city’s population had been experiencing cuts to the hot water supply for the previous six months. Worse still, the Ukrainian government no longer had any way of obtaining the money needed to meet its budget commitments. According to official figures, industrial production in Ukraine in October 2014 was running 16.3 per cent below the level a year earlier, and immediately after the elections the governors of the National Bank complained that, for practical purposes, the country no longer had any gold reserves. Considering that Ukraine’s state debt now stands officially at $74 billion, the country is clearly in no state to make even current debt service payments, and the only guarantee that can be offered for new tranches of the loan from the International Monetary Fund will be the anti-social measures demanded by the West, in the form of increased utility charges and reduced social benefits. Kyiv residents have now been told of a coming rise in the price of metro tickets from two to five hryvny. Had the Yanukovich government still been in power, news of this kind would have been met with large popular protests. But in the state of militarist psychosis that has seized Ukraine, almost any anti-social measures are blamed on “military necessity”, and attempts to protest against them are viewed as treason. Meanwhile, the Ukrainians who dream of walling themselves off from Russia are finding that the doors to the labour migration that in earlier times helped the authorities to relieve social tension are being closed off. Relations with Russia are in crisis, and the situation to the west is no better. During the protests on the Maidan, participants in the movement were promised that once victory was achieved citizens of Ukraine would be given the right to enter the countries of Western Europe without visas. This was one of the main tools used in mobilising public support for the anti-government demonstrations. Unfortunately, after the change of regime everything turned out differently. The European Union, fearing a flood of refugees from a country gripped by civil war, simply made the process of obtaining a Schengen visa more difficult for Ukrainian citizens. In appealing to their fellow Ukrainians, the activists of the Euromaidan promised them not only free access to Europe, or else a worthwhile life corresponding to the social and economic standards of the European Union. Far more audible during the protests were demands for the democratisation of Ukraine’s social and political life, and for the ending of the political censorship that in the view of leading opposition figures was exercised by the mass media. Sadly, a year of post-Maidan reality has brought obvious setbacks for civil liberties. The Yanukovich regime provided its opponents with incomparably greater freedoms than the Russian, Belarusian or Kazakh colleagues of the deposed Ukrainian president allowed their critics. During the Yanukovich years the opposition in Kyiv had been able to mount political protests freely, while the radical nationalists had encountered no problems in training their youth in militarised camps. In February 2013, less than a year before the beginning of the Euromaidan, ultra-right militants armed with knives had seized the building of the Kyiv Rada, unfurling racist flags bearing the “Celtic cross”. None of the participants in this incident was charged, even though in the US or EU the perpetrators of such an attack would undoubtedly have received long prison sentences. Immediately after the victory of the Euromaidan, however, the situation changed sharply. The political opposition was effectively outlawed. The offices of the Communist Party of Ukraine in Kyiv and the country’s west were sacked, and during the election campaign members of the party, together with former “regionals”, were subjected to constant attacks by nationalist supporters of the Maidan. The more radical Borotba Party was forced underground. According to official figures of the interior ministry and the Ukrainian security service, the number of political prisoners no longer numbers in the hundreds but in the thousands, and videos showing abuse of supporters of the former regime – mainly women – appear regularly on Youtube. One of the founders of the Ukrainian human rights movement, the former Soviet dissident Vladimir Chemeris, has revealed the facts concerning systematic breaches of civil liberties. People are persecuted even for comments on social media sites. Hence Stanislav Sichev, an underage resident of Chernihiv, was summoned to the Ukrainian security service together with his mother, who was told to ensure that her son remove from his page critical postings he had made concerning Ukrainian oligarchs. Special forces police forced their way into the apartment of young Dnipropetrovsk resident Mariia Matiushenko, who had posted several anti-war articles on the Vkontakte site. The police seized the computers and telephones of all members of the woman’s family, including her underage sister. Under the control of business figures loyal to the government, the mass media for the first time in Ukraine’s post-Soviet history introduced full-scale ideological censorship, concealing from the public the real losses suffered by the Ukrainian army as well as information concerning crimes committed in the “zone of anti-terrorist operations” by Ukrainian government forces and members of “volunteer” armed formations. This was despite the fact that Western human rights defenders had already detailed these crimes in their reports. “Self-censorship”, amounting in practice to a voluntary refusal to inform the public on the realities of the civil war in Ukraine, became a measure of patriotism. Opposition journalists were effectively denied the ability to present their views in leading publications and on the main television channels, while their colleagues who supported the new authorities demanded the right to decide whether the dissidents should be allowed to practise their profession. Although media figures loyal to the regime also suffered in the new circumstances – thus the journalist for the pro-government Insider program Artem Chapay, who had agreed officially with the Ukrainian security service that he would make a reporting trip to the “zone of anti-terrorist operations”, was thrown into a cellar in the city of Izium, a considerable distance from the front. There, as he later reported, he was subjected to abuse by soldiers of the Ukrainian army. Amid the total criminalisation of society, however, the persecution of media workers is merely the tip of the iceberg. “We are now seeing growing numbers of crimes in which the perpetrators are members of various battalions or participants in the anti-terrorist operations,” a spokesperson for the Kyiv police told journalists for the opposition newspaper Vesti. The editorial staff of this publication have been threatened by the ultra-right, and have had their premises searched by agents of the Ukrainian security service. The governor of Lugansk Province Hennadiy Moskal was at one point forced to free police officers and business entrepreneurs abducted by the Aidar Battalion, while the office of the general prosecutor has laid charges over the shooting of Ukrainian soldiers executed by half-drunk officers for engaging in political arguments. Only the fact that one of the soldiers survived prevented this crime from being written off as the work of “Donetsk militants”. What lies behind these obvious changes for the worse? Regime spokespeople talk of the Euromaidan overloading Ukraine’s political life, citing as examples the law on “lustration” and the holding of parliamentary elections ahead of schedule. The widely proclaimed lustration, however, is perceived by society as an undisguised farce. Ukraine’s current president, Petro Poroshenko, was among the founders of the Party of Regions, and held the post of minister for economic development and trade in the Yanukovich government. In practice, the victims of the “purge” will mostly be quite apolitical people, such as the member of the Academy of Sciences and leading expert in the field of aerospace engineering Yuryi Alekseev. Meanwhile, the victory of the Maidan has substantially increased the influence of the Ukrainian oligarchs, who for the first time have been given political control of key regions of the country. The billionaire Ihor Kolomoyskyi, who has become governor of Dnipropetrovsk Province, is now among Ukraine’s most influential politicians. At the same time, the commanders of ultra-right armed formations financed by these same oligarchs have entered the parliament. Among these are the commander of the Azov Battalion Andrey Biletsky, known for his openly neo-Nazi views; the commander of the Donbass Battalion Semyon Semyonchenko; the commander of the Dnepr-1 Battalion Yury Bereza, and the Aydar commander Sergey Melnichuk. For the first time in the post-war years, an entire group of ultra-right military figures are seated in the parliament of a European country. There, they make open threats to bring their weapons to the sittings of the Supreme Rada and to settle accounts with their opponents. Meanwhile on November 17, the precise anniversary of the Euromaidan, the Kyiv police joined with thugs hired by a construction firm in brutally dispersing a protest against new construction work in the Kyiv residential district of Osokorki. Among those guarding the building site, journalists and the bloodied participants in the protest recognised their erstwhile comrades from the Maidan. Our divided country is plunging into crisis, and it is obvious that over the past year, nothing in Ukraine has changed for the better. Under this “purification” law, as many as 1 million Ukrainian government employees are subject to screening, and to varying sanctions, for their involvement with the old regime.